This cake is glazed with chocolate ganache and topped with a piece of dark chocolate depicts a fabulous and simple Cinnamon Lakeside cake. 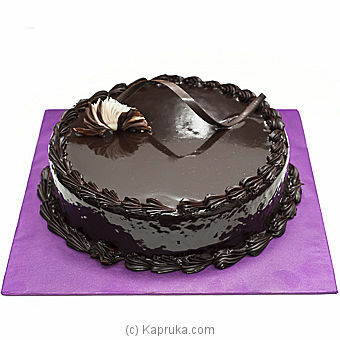 Gift your loved ones with the tempting and fabulous cakes, from a place where `The Perfection is mastered`. Absolutely irresistible and deliciously baked fresh cakes from Cinnamon Lakeside Colombo, is the best way to please and make your loved ones delightful on a memorable day. Kapruka in relation with The Cinnamon Lakeside who have won the millions of hearts of the Sri Lankans around the world, facilitates its customers to declare the deepest thoughts for a special person in their world with this truly magical taste blended with the artistic and edible creativity.